Both gravitational and magnetic data is used to describe the underground geology. This illustration is of gravitational readings locating structures in the South Sound. Click the image for a larger view. A few years ago, the Steamboat Peninsula was visited by a research team from the Geologic Hazards Science Center of the U.S. Geological Survey. These researchers were using equipment to view cross-sections of geologic structures far beneath the ground. This last July, the results of this research, a paper entitled, Shallow geophysical imaging of the Olympia anomaly: An enigmatic structure in the southern Puget Lowland, Washington State, was published. A significant benefit of this kind of research is to identify areas where stress might build and quickly release in the form of an earthquake. The Puget Sound occupies a seismically active area, located along a line where the Juan de Fuca plate is squeezed under the North America plate. 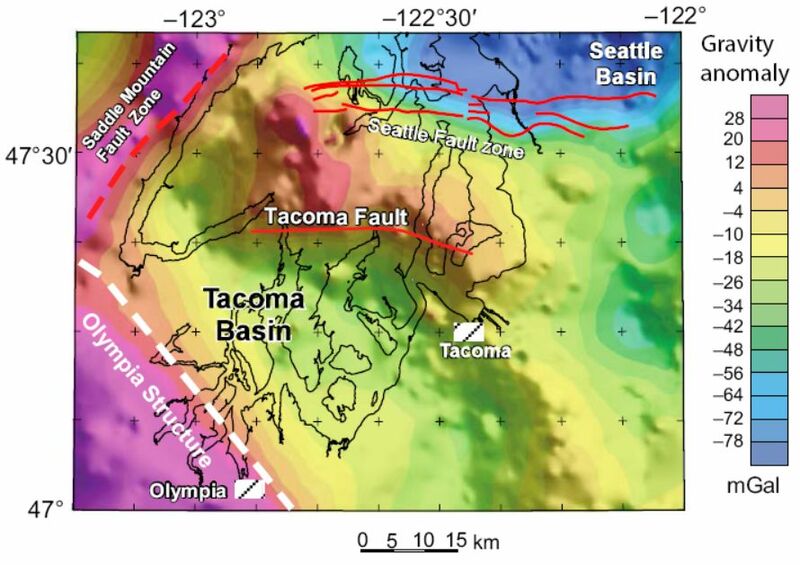 The convergence of the Juan de Fuca plate, at a rate of ~50 mm/yr (Atwater, 1970; DeMets et al., 1994), has historically produced great (magnitude, M8–9) earthquakes on the Cascadia subduction zone (e.g., Nelson et al., 2006) that pose a primary seismic hazard for the region (Petersen et al., 2002). Photo by Bob and Barb, Washington State Trails Association. Part of the pleasure of living here is the easy access to Capitol State Forest. One piece of the State Forest is less than 6 miles from the Steamboat Island Road exit. If you go to Mud Bay and then go up the hill toward Olympia; take a right at the top of the hill. Follow Delphi Road SW for 3.2 miles. You will then find on the right side, McLane Creek and Forest Trails. Click here to map your own directions. The park is run by the Department of Natural Resources and closes at dusk. There are picnic shelters and restrooms and wonderful viewpoints. There are three trails, two of which circumnavigate a large pond and a small lake. 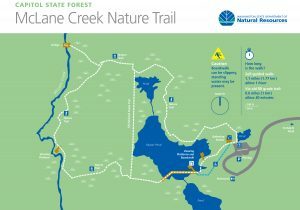 Click image for a downloadable trail map. 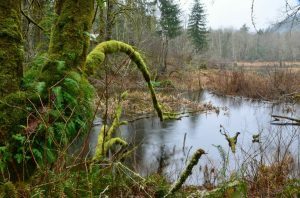 Numerous birds, amphibians, and beavers live at the water. Salmon swim home in the fall. The trails are short and protected from the rain by trees. You should always dress for the weather and stay out of the woods when it is windy. Enjoy this little bit of Pacific Northwest paradise. A state Discovery pass is needed to park at McLane Creek. You can buy a pass online or at 22 locations in Thurston County. 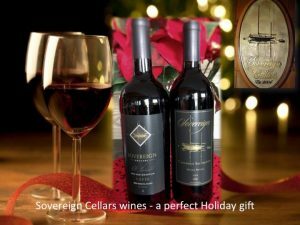 Check it out at discoverpass.wa.gov. Mr. Nugent's books include Life in Young Cove . In an average year, there are more than 225 overcast days in Olympia. And we're coming into the darkest, rainiest part of the year. What's a body to do? Winter is a great time to write that book you've always wanted. In the past, getting published was as difficult - or more so - than writing the text in the first place. Nowadays, with the tools available online, it is easy to publish and sell your work. Here are some steps you can use to publish and sell your paperback, ebook, and audio book. What accounts do I need to set up? kdp.amazon.com Kindle Direct Publishing is your route to publish online to customers in the U.S., Canada, UK, Germany, India, France, Italy, Spain, Japan, Brazil, Mexico, Australia and more. www.createspace.com CreateSpace provides easy tools to create your paperback edition. www.acx.com ACX provides the tools to turn your book into an audio book, for sale on Audible, Amazon, and iTunes. "ACX Puts You in the Director's Chair." 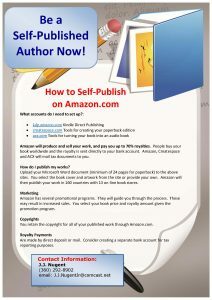 Amazon will produce and sell your work, and pay you up to 70% royalties. People buy your book worldwide and the royalty is sent directly to your bank account. Amazon, CreateSpace and ACX will mail tax documents to you. How do I publish my works? Upload your Microsoft Word document (minimum of 24 pages for paperback) to the above sites. You select the book cover and artwork from the site or provide your own. Amazon will then publish your work in 160 countries with 13 on-line book stores. 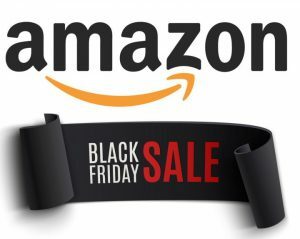 Amazon has several promotional programs. They will guide you through the process. These may result in increased sales. You select your book price and royalty amount given the promotion program. You retain the copyright for all of your published work through Amazon.com. Are made by direct deposit or mail. You may want to consider creating a separate bank account, for tax reporting purposes, to receive your royalty payments. Mr. Nugent's books include E-Book Writing and Beating Writer's Block, Writing Interesting E-Books, and Writing My First Books. These are available from Amazon.com as a paperback, audio book, and for the Kindle. 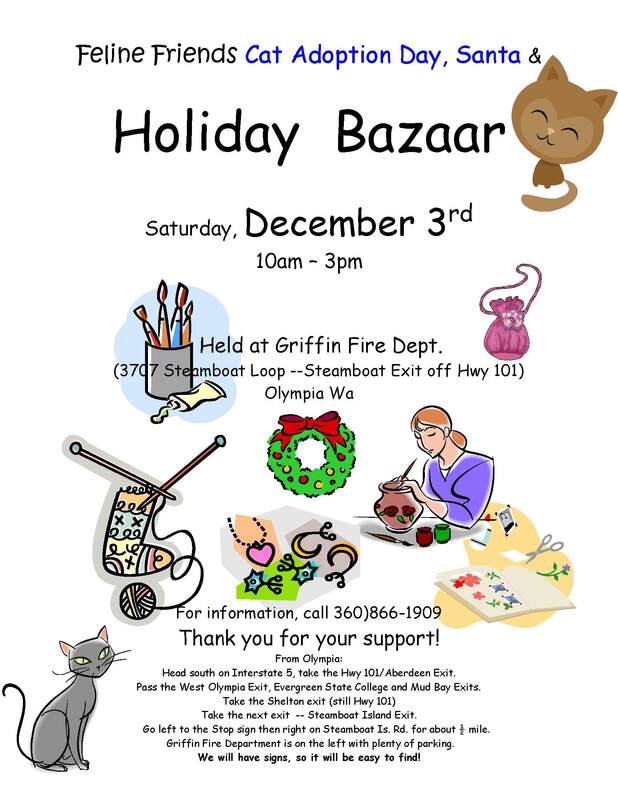 The Griffin Neighborhood Association, budget-wise, runs a pretty slim operation. 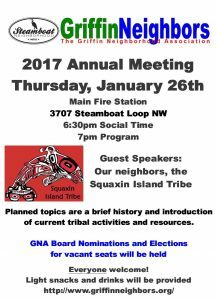 For example, thanks to a generous contribution by South Sound IT and the work of a volunteer webmaster, this web site operates at pretty much no cost, to the GNA. But if you’ve picked up one of the several thousand “Steamboat Neighborhood” stickers we’ve distributed, then you’ve received at least one tiny benefit from the Association. If you are a contributing member, thank you so much! 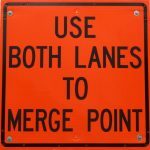 And if you’re not, please click here to join us (we’ve been around for more than 26 years and, with your help, the Griffin Neighborhood Association will be here for many years to come). But your membership in the GNA isn’t the only way you can lend some financial support to the Association. When you shop on Amazon.com, your purchases can produce a small commission to the GNA. If, that is, you start your shopping at https://steamboatisland.org/amazon Even better: click on the link https://steamboatisland.org/amazon and then bookmark it as your Amazon link, so all your shopping on Amazon will help support the Griffin Neighborhood Association. Our families wish you and yours all the best, this Thanksgiving. And we thank you for your support of the Griffin Neighborhood Association. I recently joined the Port of Olympia Harbor Patrol. With three other men and one woman we became the recruit class Spring of 2016. 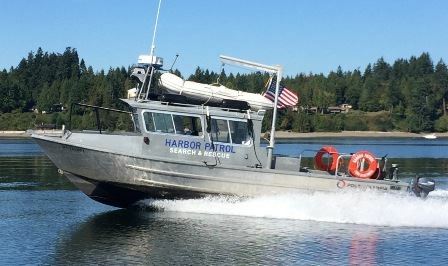 The Harbor Patrol is directed by the Port of Olympia and it is an all-volunteer non-law enforcement organization dedicated to port security, marine search and rescue, and public safety and education. We have a 28 foot patrol boat and volunteers are trained carefully in all their functions. No previous knowledge or skill is required to serve on the Patrol. They will teach you! Volunteers must be at least eighteen years of age and pass a background check and a drug screening. Click here for more information about the Port of Olympia Harbor Patrol. Or click here to indicate your interest in volunteering for the Harbor Patrol. Safe boating! Update: The Port is accepting applications for Harbor Patrol Volunteers through January 22, 2017, at 11:59 PM. Click here for more information. A recent book, Adventures on the Olympia Harbor Patrol, is available from Amazon.com as a paperback, audio book, and for the Kindle.